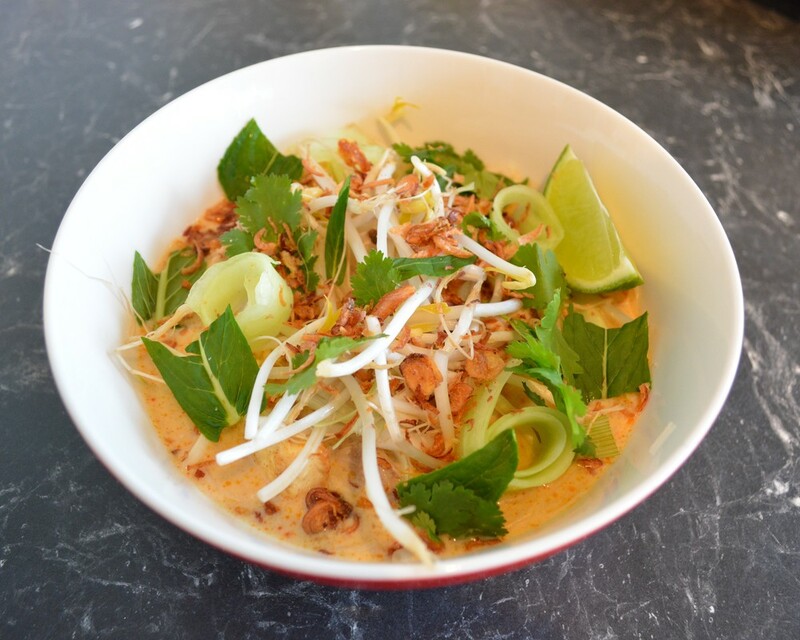 My husband loves a good Laksa. If we go out to a Thai restaurant he will always order one. So I am one of those people that has to try and cook foods I really have no idea how to cook, just to see if I can. I did 'trust' the cookbook I got it from, so far everything I tried from it, we loved, so I did have that going for me. Making this I had no idea if my kids would eat it, but they had to try it, that is my rule. If I cook it, you must try it. As for my husband I hoped I got close to the restaurant ones he has. He usually has a seafood one, but I went with chicken this time. Now I see that the base can be the same and you can simply swap chicken for fish, quite easily. That is for the next time I make it. Well let me just say it was a huge hit with all 5 of us. My kids loved it. They loved the accompaniments, they got to choose what to add and how much they wanted to add. My husband loved it to, actually said it was less oily than the restaurant ones he has. The original recipe used chicken breast, but I just don't like chicken breast, I find it dry and stringy in soups, but if you prefer chicken breast, use it. Also the laksa paste I used was not very spicy, so once I add the coconut milk, I taste for spiciness and add extra red chillies if required. This is a soup, yes, however it is also a meal in itself, with the noodles and other sides, you really don't need anything else. The recipe states 50g beans sprouts, but as my family love them they wanted more, so 50g is a guide only. I loved the mint leaves, coriander and spring onions, actually I loved everything that went into this soup. Also I know you fry some shallots here, but please buy some store bought fried shallots, they add a nice crunch to the dish. You'll find them in the Asian food section in your supermarket. For the poached chicken: Add the chicken to a medium sized saucepan. Cover with enough cold water to just cover the chicken. Add all the other poaching ingredients. Turn on the heat to medium, this allows the mixture to come to a simmer slowly, not boil too quickly. Once it comes to a simmer, allow to simmer for 15 minutes. Turn off the heat, and leave the chicken to sit in the poaching water for 15 minutes before taking it out. Remove the thigh meat from the bones and thinly slice across the grain. For the fried shallots: Heat a small frying pan over medium heat, add the extra olive oil, then the shallots. Sauté, stirring regularly until the onions have softened and browned. They will become crispy-ish. Place on a plate, set aside for later. Cut the noodles in half horizontally. Place the noodles in a heatproof bowl. Add boiling water from the kettle, cover the noodles with the water. Set aside for 3 minutes or until the noodles have softened slightly. Drain and set aside. Heat a wok over medium heat until hot. Add the oil, swirl to coat the wok. Add the laksa paste-it will splatter a bit, cook, stirring for 2 minutes or until fragrant and the oil separates from the paste. Add all of the stock, bring to the boil. Add the coconut milk and bean curd, reduce the heat to medium-low. 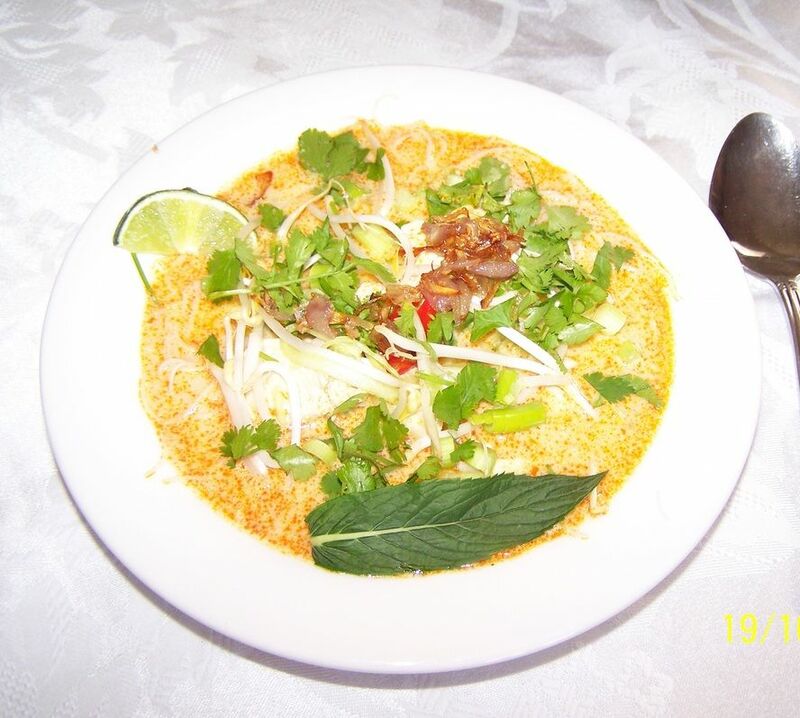 (Now you need to taste the laksa base for spiciness. If you need more spice add 1-2 red chillies. Every laksa paste is different some hotter than others, by adding the chillies you control the heat). Simmer for 10 minutes. Add the sliced chicken. Combine the palm sugar, lime juice and fish sauce, pour it into the wok, simmer for 3 minutes or until the chicken is warmed through. Divide the noodles among serving bowls, then ladle over the soup. Top with bean sprouts, cucumber, mint, coriander, green onions and the fried shallots. Serve with lime wedges and extra fried shallots.